1931 Ford Coupe. This car was a very rare find - an 85 year old car with few miles on it and zero rust. I included a photo of the car as we got it and with its original paint, also when it was all apart during the restoration. As the photos show we repainted it with doors, fenders, hood and trunk removed, It is a two stage paint job in dark green and black, color sanded and buffed. Mechanically it is all original, the motor, trans, brakes - everything works. All we had to do was replace the water pump and rebuild the starter, clean the gas tank and fuel system and install some new spark plugs. It runs great! For the interior we installed all new upholstery and door panels. The floor was sanded and re-varnished. So if you\'re looking for a really special, all original Model A in great condition, here it is. 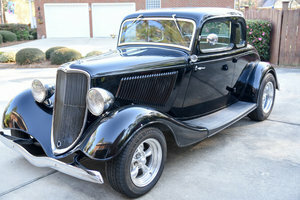 This just may be one of the most solid 31 Ford coupes available anywhere!